Executive Director Steve Currie discusses county participation in a partnership with the state and Pew at an event in Lansing on April 17, 2019, as (left to right) Gov. Gretchen Whitmer, Lt. Gov. 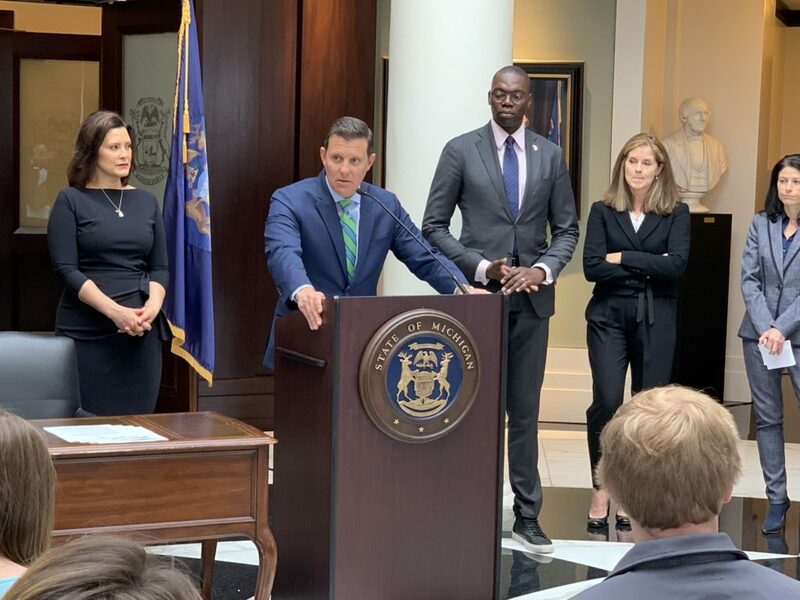 Garlin Gilchrist, Chief Justice Bridget Mary McCormack and Attorney General Dana Nessel look on. Michigan’s 83 counties helped announce an innovative partnership with the state of Michigan and a national nonpartisan research group today to use data to identify best practices for jails. The Michigan Task Force on Jail and Pretrial Incarceration, (#MICJReform) an interbranch, bipartisan body will develop recommendations to expand alternatives to jail, safely reduce jail admissions and length of stay, support crime victims and better align practices with research and constitutional principles, Gov. Gretchen Whitmer announced today at a press conference at the Hall of Justice in Lansing. National sources show Michigan jail populations have tripled in the last 35 years, growing regardless of whether crime was going up or down. With crime now at a 50-year low, hundreds of thousands are still admitted to Michigan jails every year, and people are staying in jail longer on average than before. Today, half of the people in Michigan’s local jails are un-convicted and constitutionally presumed innocent while they await trial. Many of these individuals are in jail because they cannot afford bail, not necessarily because they are a flight risk or threat to public safety. The task force will be supported by technical assistance staff from the Pew Charitable Trusts. “The focus here will be on using data to drive solutions. Everyone is entering this effort with no preconceived notions and we are eager to partner with the state, Pew and others to make Michigan a leader in public safety,” Currie said. 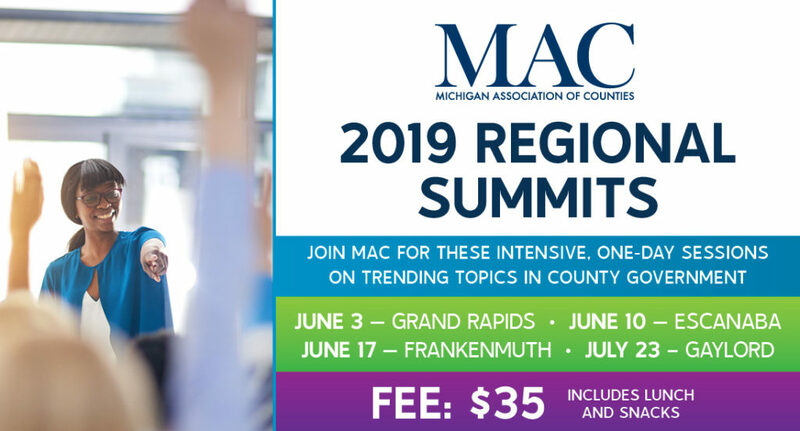 Commissioners and other county leaders can network with legislators, learn tips on drafting capital improvement plans and be briefed on cutting-edge economic development tactics at a MAC Regional Summit this summer.